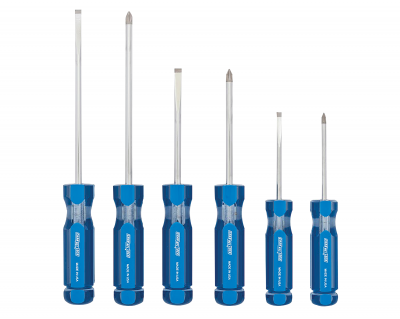 6D-6A Channellock 6 pc Screwdriver Set Made in U.S.A.
6D-6A Channellock 6 pc Screwdriver Set Made in U.S.A. . High torque. Custom heat -treat alloy blades . Nickel chrome finish for exceptional corrosion resistance. Precision machine vapor blast tips for a precise fit. Includes: 3 slotted,3 phillips 1/4" x 6",#2 x 6",1/4" x 4",#2 x 4",3/16" x 3" and #1 x 3".